alaTest has collected and analyzed 96 reviews of Zoom Q4. The average rating for this product is 3.5/5, compared to an average rating of 4.1/5 for other Camcorders for all reviews. Comments about the size and price are generally positive. The portability and zoom are also appreciated. Opinions about the viewfinder and reliability are different, and there are some critical views about the durability. We analyzed user and expert ratings, product age and more factors. 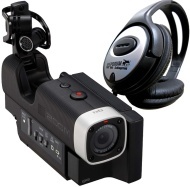 Compared to other Camcorders the Zoom Q4 is awarded an overall alaScore™ of 86/100 = Very good quality. This is my first video camera so it is easy to understand. It's very small so it is easy to take anywhere. Very good sound. Very compact and yet delivers big results. Great audio and video quality, easy to navigate. Overall a great product for what I use it for. If you're looking for great zoom features though, this isn't your camera. Video and sound quality and solid for the price point. In hindsight I'm not sure why a zoom function wasn't included. Ironic with the company name.